Meet your group at 7:30 am. We'll take a two-hour bus ride to Boundary Creek and start our trip. At 6,000 feet elevation, the air is crisp and the forest thick with fir and spruce. At the river, we'll go through a safety orientation while your personal gear is loaded onto our rafts. After orientation, everyone chooses a raft (paddle or oar-powered) and climbs aboard. 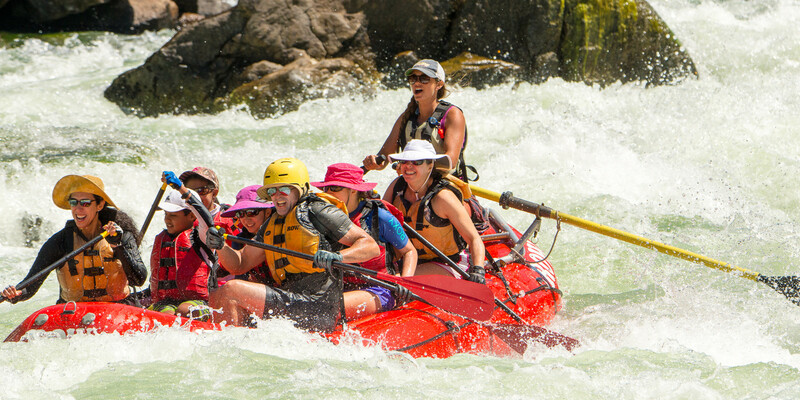 The first 15 miles of the Middle Fork are fast and rapids are steep, narrow and come in quick succession. During lunch, we'll explain how we minimize our impact on the river with Leave No Trace camping ethics. After lunch, the river continues to be lively and challenging. Every few hundred yards a creek tumbles into the river increasing the flow. We travel between 10 and 15 miles the first day and arrive at camp around 4:00 pm. Enjoy the free time for hiking, fishing, reading or just relaxing. Hors-d'oeuvres are served around 6:00 and dinner around 7:30. After dinner, a campfire is lit and the warmth invites all to share stories of the day, and life. We awake around 7:00 am and enjoy fresh-brewed coffee. Breakfast is served and you pack up your personal gear. The rafts are loaded and we depart from camp around 9:30 for an adventure-packed day of rapids, magnificent scenery, and fun. We make it a point to visit one or two pioneer homesteads on these first few days. We'll likely stop to explore the old miner’s camp at Powerhouse Rapids. Today’s a good day to keep your eyes open for the nest of the American Dipper, a small gray bird that swims underwater and builds its nest above fast-flowing water. We'll have plenty of fun rapids as the river continues its quick descent. We’ll stop for a soak in Sunflower Flat Hot Springs where several pools above the river cascade over a rocky cliff to create nature’s perfect shower. We make camp around 4:00 pm and enjoy hiking, fishing and relaxing. After dinner, the night sky welcomes stargazers and, later on, the river lulls you to sleep. The river canyon opens now and we’ve dropped over 1,500 feet in elevation. Days and nights are warmer. The fir and spruce give way to ponderosa pines, sagebrush, and riparian hardwoods. The sparkling-clear water carries us swiftly along as the river channel widens and narrows with the underlying geology. One of today's highlights is stopping to view pictographs of the Native American Tukudeka, or Sheepeaters, who lived in this canyon until the 1870’s. The afternoon is casual as the current slows a bit. We'll learn about early pioneers like Charlie Norton, who had a run in with a bear as amazing as the saga of Jedediah Smith. By mid-afternoon, we arrive at camp near Loon Creek, around 50 miles from our starting point. Tonight’s highlight is a hike to the Loon Creek hot springs and anglers may enjoy casting a line into Loon Creek. Summer evenings are long, with darkness arriving around 9:30 pm in June and July. The night sky, crackling campfire, and fresh mountain air will help you sleep like a baby. Another day of fun rapids and incredible Rocky Mountain scenery. We’ll likely see bighorn sheep as we pass several mineral licks. Those fishing will continue to find bountiful trout and birdwatchers are likely to spot golden eagles and falcons. We pass our last hot spring at Hospital Bar, so named because early cattlemen let their stock rest and feed at this large flat and easy ford across the river. We'll also see Tappan Ranch, where Red and Daisey Paulsen-Tappen grew a bountiful garden and raised a family with self-sufficiency and $300 a year in the 1920’s and 30’s. Continuing on we run the Tappan rapids. This is a great photo opportunity with plenty of splashes and thrills. The final miles to camp offer a chance to lean back and take in the monumental scenery of the River of No Return Wilderness. Today we run Haystack Rapid, the most dynamic rapid on the river. Side canyon “blowouts” have changed its course twice in the last few years. This is the official start of Impassable Canyon. Below Haystack rapids, the canyon narrows and deepens creating a series of action-packed rapids. A favorite stop is at Waterfall Creek, where a steep trail leads up to the Bighorn Crags. We walk beneath the falls and on hot days finish with a jump into the river. Shortly downstream the river cuts into the Idaho batholith – the largest monolithic chunk of granite in North America. The river has carved into the granite and created towering walls for neck-bending panoramas. Further downstream we stop to hike to the base of Veil Falls, a soul-stirring cavern replete with pictographs and magic. Today’s scenery is truly among the most astounding on earth. From camp, the silhouette of canyon walls against the wine-dark sky will captivate you as you reflect, celebrate and further connect with newfound friends on your last night on the Middle Fork. As we push off from shore the river takes us past the former hideout of Earl Parrot, Hermit of Impassable Canyon. His story is as big as the canyon and adds just one more thread of wonder to your Middle Fork experience. As the sun breaks over the canyon rim, more big rapids greet us as we pass beneath vistas of staggering dimensions. We stop to enjoy lunch on a glistening sand beach just a few miles above the Middle Fork's confluence with the Main Salmon. We proceed onto our takeout, carry personal gear to the waiting bus and settle back for a two-hour ride to the town of Salmon. Enjoy a hot shower and change of clothes then meet your guides for ROW’s hosted farewell dinner. If you drove to Stanley and had your car shuttled, it is waiting for you at the hotel. If you are flying home, you'll board an air taxi for the one-hour flight back to Boise to connect home. You may consider visiting our own River Dance Lodge, a beautiful log cabin adventure resort just a few hours drive away. Horseback riding, hiking, fishing, and biking are a few of the available activities. Leave your car at the motel in Stanley at the beginning of the trip. River Shuttles will drive your car from Stanley to Salmon. You can prearrange a shuttle online with River Shuttles directly before your trip or you can arrange the shuttle at our orientation meeting the night before your trip. The cost is about $150, not including gas, payable by credit card, check or cash directly to the shuttle company. The Mountain Village Lodge charges an additional $15 per vehicle left for shuttling. The nearest major airport is Boise and you need to arrive in Boise the day before the launch dates listed, arriving no later than 4-5pm. From Boise you have two options: 1) Take an air taxi from Boise to Stanley and then from Salmon to Boise at the end of the trip. The cost is roughly $400 including tax. Please call Gem Air at 208-756-7382 or Sawtooth Flying Service directly at 208-634-7774, to make these reservations. 2) Rent a car and drive about 3 hours to Stanley. Then have it shuttled to Salmon for about $150, not including gas, payable by check or cash directly to River Shuttles company the evening before the trip. The Mountain Village Lodge charges an additional $15 per vehicle left for shuttling. Then your car will be awaiting you at trip's end. It's about a 6-hour drive back to Boise from Salmon. If you are flying back to Boise, you should not book your return flight out of Boise until after 8:30 am the day after your trip gets off the water. Because the Middle Fork has no dams the water is highest when early-summer warmth melts the snow from the high peaks. The winter’s snowpack affects each season’s water levels. Therefore June to early July, in general, is the time to come if you have previous rafting experience and are seeking high water thrills. Mid-July brings somewhat lower flows as the bulk of the snowmelt has already run-off and we welcome novice rafters. The river gradually gets lower as the summer passes, bringing incredible clarity and magic to the crystal waters. Latter August and September are wonderful times to be on the river as few other people are around, the colors of the hills become more radiant, and fishing is at its best.